A K Benedict read English at Cambridge and studied creative writing at Sussex. 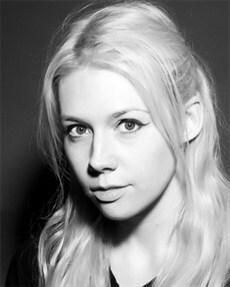 She now composes film and television soundtracks, as well as performing as a musician. She lives in Hastings. Find out more at www.akbenedict.com. Death is the greatest of mysteries. After all, it figures in almost every crime novel. And certainly every life. It hides, waiting, not letting itself be known till right at the end like the very best of antagonists. Often viewed in this culture as something to be feared, death is ignored where possible, as if looking at it will draw its attention your way. Many avoid planning their funeral because they don’t like to think of dying. Somewhere along the century, we have lost the art of dying. Crime fiction at its best does not flinch from death. It holds it up as a reality to be respected and railed against. Of course, there is no common approach. There are those deaths that take place off screen and those that are vivid and violent. Some are investigated until the violating perpetrator is caught, death’s scapegoat slain so we can go home knowing that death is for someone else today; for others there is no balancing justice for a life ripped away. 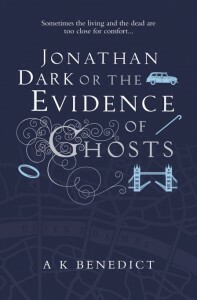 I knew I wanted to explore death in Jonathan Dark or The Evidence of Ghosts from early on in the planning stage. I was grieving at the time: for friends and family members; for pets; for a marriage and felt unable to talk freely about loss. Then I saw a tweet about the Death Salon 2014 in London. Held at St Barts Pathology Lab in London, the talks on each day of the conference represented a part of the dying process: the first was preparation for death; the second day the act of dying itself; and the final day was after death. It was attended by undertakers, mortuary assistants, archaeologists, historians, anthropologists, artists, dark tourism specialists, writers. . . and all were keen to discuss death in an open way. I left as a passionate advocate of the Death-Positive movement, feeling joyous, excited and that death was a friend reminding me to live now. The Death Salon helped me to not only exorcise some of my own ghosts but also to clarify my conception of a ghostlocked world in Jonathan Dark (not least because I was wandering around Smithfield’s after the first day, possibly inebriated, and thought I saw the spirit of a butcher carrying a side of beef). Personifying the things that haunt every one of us meant that I could look at loss square on as well as through a spectral veil, placing death as a narrative arc as much as life. Crime fiction whips the sheet off the spectre of death and exposes it to the light. The greatest mystery is never solved but, in acknowledging it, shadows skitter; ghosts retreat and we can begin living right now. PS - It’s a good idea, by the way, to have a Death Wish List: what you’d like for a funeral, whether to be buried or cremated and where etc. It saves your loved ones second-guessing your desires during their grief. If you don’t, there may never be that New Orleans marching band playing David Bowie songs at a woodland burial. That’s mine, by the way, just so it’s written down for posterity. I’d also like gothic cupcakes, gin and tonics and karaoke at the wake. You’re all invited. Maria King knows a secret London. Born blind, she knows the city by sound and touch and smell. But surgery has restored her sight - only for her to find she doesn't want it.